Scribbled Slate: Heard of Hydropolis? 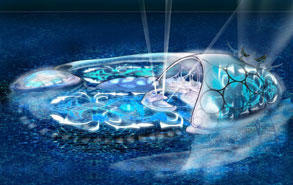 Hydropolis will be world's first underwater hotel. "It costs £300 million, has 220 suites and covers 260 hectares, about the size of London's Hyde Park. It will be about 20 meters under the sea, or 44 feet. it has been planed that it will producing their own clouds, to protect guests from the persian gulf sun. One of the reasons it was built is that so people who cannot swim will be able to explore the wonders of the sea." Check out these dubai-project visuals..believe me they will blow you away. What has become of me !